Born in Long Island, New York, George Ottoni is the first generation Brazilian-American in his family. His father shared his love for sailing with his young son with a fleet of seven model sailboats. Years of racing at New York’s annual Central Park Regatta resulted in a New York Times story depicting their boat in the lead, turning back halfway, and still finishing in 3rdplace. George became “hooked” on boating for life. In 1985 while working as a mechanical engineer in the aviation industry, George received an offer to return to the States with GE Aircraft Engines in Cincinnati, OH. It was his dream job, designing, stress testing and flight-testing commercial and military jet engines. George earned numerous awards, particularly one for his sense of customer service and unique solution that enabled the Airbus A320 Certification to be completed on time. It was in Cincinnati that George raised his two daughters and son, now in their 20s and 30s. In 1993 and capitalizing on his language skills, George began a new career by starting his own company, Vice-Versa Translation Services, Inc. His range of services quickly grew to offering advertising and technical translations in any language, contracting the highest quality translators around the globe. George’s mission is to exceed customer expectations, delivering the best quality translations, and Vice-Versa constantly receives stellar praise as proof. Being his own boss provided George the opportunity to buy his first boat in 1998, a 53’ Hatteras Classic motor yacht. In 2000, George purchased a 32’ Silverton aft cabin that he took on an exciting adventure, navigating the rivers and locks all the way from Cincinnati to Miami. 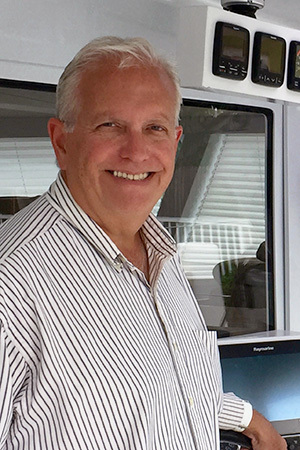 After 21 years of operating a home-based business, George chose to reconnect with his boating dream and obtained a Florida Yacht Broker’s License, working with Florida Yacht Group and then Denison Yacht Sales. Now he is delighted to join a company he has admired all along that concentrates on multihulls. He will be catering to the South Florida and South American markets. George is excited to share his passion for boating with his customers, as well as exceed your expectations in English, Portuguese and Spanish! Multilingual: Speaks English, Portuguese and Spanish, and some French. I can’t imagine how anyone could navigate the process of purchasing a vessel without the dedication, care and thoroughness of your organization. © Copyright 2017 The Multihull Company. All rights reserved.